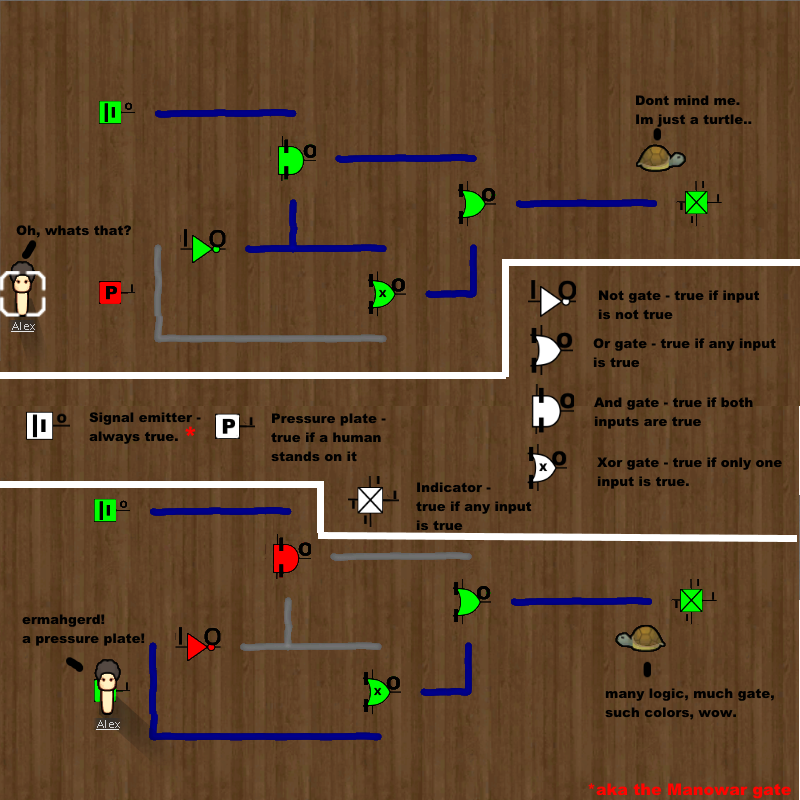 This is the all new Bluestone (totally not stolen from any other game) logic system. Yes this is a fully functional logic system with tile-to-tile signal propagation loosely based on flood fill. At the moment this is only a prototype with basic functionality and some gates but its easy to integrate in any other mod since it works with simple bools and most parts are public. The Bluestone Lines can be built on the same tiles as Power Conduits but are hard to see if both are on the same tile because they both use the same texture at the moment. Gates can not transfer signals between each other - you HAVE to place a Line in between. Inputs of all gates are indicated with I while outputs are indicated with O - dont you say? Please note that gates with multiple inputs have their inputs on the top and bottom side. Gates and Lines sometimes act funny (eg keeping their state on destruction) - to reset a logic circuit locked in a state apply a NOT gate and toggle signals a few times or rebuild it. Feedback much appreciated - see you on the other side. I have a hard time getting the colors to update at the right time which means the actual state may differ from the color representation of the texture. They somehow only refresh when a building is placed. - I could use a hand on this. source - nothing special to see here. So aside from adding blue power conduits and all the other stuff... what does this do exactly? Whatever this is inspired by is something I've not seen before apparently and the description isn't exactly clear on the actual function. I was about to add this mod to the mod list but need a description for it and just can't figure out what it should be. Its all about logic. Its basically RedStone but in blue and with premade logic gates and in RimWorld and better. dont you just need to tell the map the tile updated to get the images to flip, i forget the method to call...good job btw. Ill try to find the manual update thing tomorrow. I spent the last few nights programming need some sleep. Fantastic! Been needing this for a few alphas already! Think he means what can he do with it. Rimworld doesnt contain buildings that react to bluestone (unlike minecraft which does have blocks that react to redstone). Ooooh yeah well.. I released the bare bone system first to see if anybody is interested in it at all - focus group testing ftw. People can easily add it to their mods so it is possible to make machines react to the logic network - lets see what happens. If people think we need this concept they will add it to their mods if we dont need it it will die. Theres your description. Its a modders resource to include logic into the game. I already have some ideas on how I would use it. McCoy: "Mr. Spock, remind me to tell you that I'm sick and tired of your logic." I'm wondering if this could be used to remotely open a powered door. For trapping invading armies in a kill-room or some such. It could if you write a door mod that uses it.